There's a lot more to Surfing than just surfing. Being willing to step out and try something new is a great way to learn life lessons. Venturing into the unknown, to something brand new, can be quite exciting. When teaching, we try to relate learning to surf to life experiences. Challenging yourself and succeeding, you'll see that when you step out on faith and give it a go, IT CAN BE DONE! It is truly an amazing sight when we see the young ones, and anyone for that matter, get up and ride! 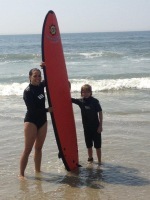 Learning to surf is a great way to build confidence and self esteem. YOU can do this! When booking your 3 day surf camp, choose the FIRST day you'll be joining us, choose 9am. As you move through your reservation, there'll be a place to write in the other 2 days you'll be surfing. 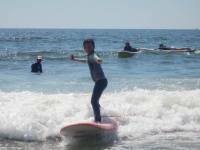 SURF CAMP IS MONDAY THROUGH FRIDAY 9AM TO 1PM. 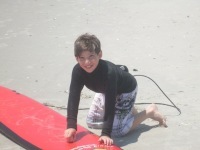 Our Kids Surf Camps, Teen Surfing Camp and Family Surfing Camps all take place on the same beach. 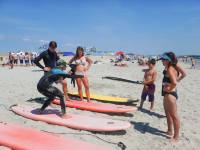 If you're coming with kids of different age groups or you would like to give surfing a go, you're welcome to surf together in the same surf camp group. We highly recommend to give surfing a go to all parents! We cannot tell you how many Mom's and Dad's came to just watch, gave it a go, and became completely hooked on surfing! Surfing is an amazing, healthy activity for a family to share. Monday thru Friday 9am to 1pm. All gear included! Students as young as 5 years old welcome!! We teach at whatever pace your young one is moving at. It's all about having fun! We Are Happy to Answer Any Questions You May Have. Email Us Below, or feel Free To TEXT/Call Us At 718-496-3371.